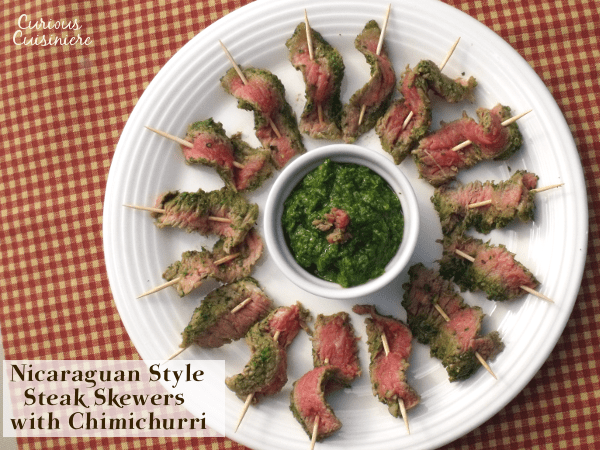 These Nicaraguan style Grilled Chimichurri Steak Skewers are the perfect appetizer for a summer party. Love grilled steak? 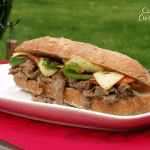 Try a Korean Barbecued Steak Sandwich! 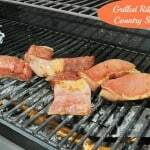 We are excited to be partnering with the Certified Angus Beef® brand for today’s Sunday Supper, sharing summer grilling recipes and tips to get you all geared up for a summer of tasty grilling. I don’t know about you, but whenever I’m at a barbecue, the smell of the grill and the meat cooking makes me so hungry! It always seems like ages until the main event is finally ready, and I get to enjoy what my mouth has been craving. A grilled steak appetizer is the perfect way to satisfy those grumbling tummies and give your guest a taste of the grilled goodness that is to come. 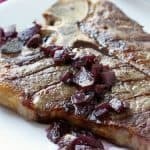 Nicaraguan style steak, or Churrasco, is a quick-cooking steak with a marinade that creates an incredibly unique flavor profile. 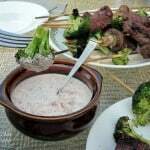 A thin steak is traditionally used, so you can throw your appetizer steak on the grill just before your guests arrive and have the skewers ready to be munched on while the main event is sizzling over the fire. Churrasco is a common term throughout the cuisine of Latin America and even can be found in Spain and Portugal. However, each region has a slightly different meaning to the term ranging from an event, to a preparation method, to an actual cut of meat. In Nicaragua, churrasco refers to a thin beef steak that is grilled, then sliced thin, against the grain, and served with a traditional chimichurri sauce of chopped parsley, garlic, oil, and other seasonings. The steak is often marinated in the same chimichurri that it will be served with to give it an extra punch of flavor. The thin steak used for Nicaraguan churrasco is traditionally skirt steak or thinly sliced beef tenderloin, however, any thinly sliced steak will do the trick. Tim loves a good strip steak, so we decided to use a Certified Angus Beef® strip steak for our Nicaraguan churrasco appetizer. 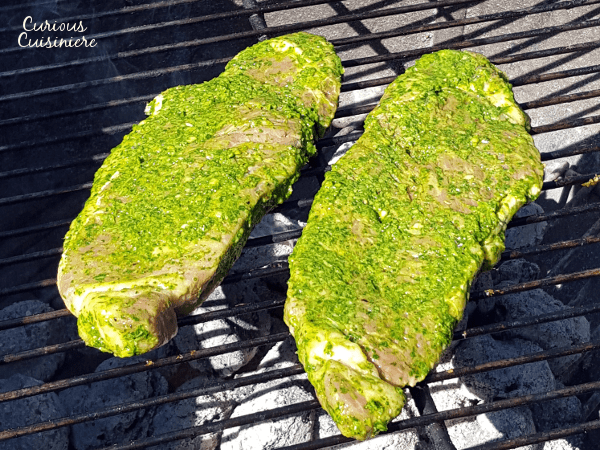 Our strip steak was beautifully thick, so we butterflied it to give us a 1/4 inch thick steak, which is the perfect thickness to achieve a great penetration of the chimichurri marinade flavors and an incredibly quick grilling time. We love using Certified Angus Beef® brand beef because we always know it will turn out incredible. And, once we learned that Certified Angus Beef® cows have to pass an additional 10 quality standards for marbling, flavor, tenderness, consistency, and appearance above what is required for the USDA grades of Prime, Choice, and Select, it was no surprise why. Only 1 in 4 Angus cattle (a breed that is known to produce more highly marbled beef) meet the standards to qualify to be Certified Angus Beef® brand beef. Now that’s some pretty special beef. With all the flavor that the marbling gives to the meat, you know you are always in for perfectly juicy and tender cuts. You can find Certified Angus Beef® brand in nearly 15,000 grocery stores and restaurants around the US and in 46 other countries around the world. We consider ourselves lucky that our local Piggly Wiggly grocery stores only carry Certified Angus Beef® brand, so picking up delicious beef is incredibly easy. Take a look at the Certified Angus Beef® where to buy tool to find grocery stores and restaurants near you that also carry the best beef around! To learn more about the quality standards of the Certified Angus Beef® brand, for information on beef cuts, and more tasty recipes, visit their website and follow them on Facebook, Instagram, Pinterest, Twitter, and YouTube. And for more great Certified Angus Beef® recipe inspiration, be sure to head on over to our Summer Grilling Recipes Pinterest board! Place the parsley leaves, garlic, olive oil, vinegar, salt, and pepper in the bowl of your food processor. Process until a smooth paste forms. (You should have roughly 2/3 c of Chimichurri.) Reserve ¼ c of the Chimichurri and place the remaining in a sealed container in the refrigerator to let the flavors come together for at least 2 hours. Place the steak in a Ziploc bag and add the reserved ¼ c of Chimichurri. Seal the bag and massage the marinade into the meat. Let the meat marinade for at least 2 hours. Place the marinated steak on the grill. Cover the grill and cook for 3-4 minutes on the first side. Flip the meat and cook for an additional 3-4 minutes on the second side. When done, your meat should still feel slightly soft. This means you will have a nice medium-rare, pink center. Perfect! 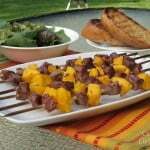 *This is a great appetizer to make ahead of time. 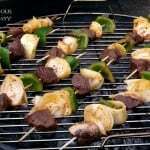 Refrigerate the meat skewers overnight and bring them to room temperature before serving. Be sure to take a look at what the other Sunday Supper members are grilling up with Certified Angus Beef® today. And then, get ready to fire up your grill, because we’re pretty sure you’ll be hungry for some beef! Disclosure: This post is sponsored by Certified Angus Beef in conjunction with a social media campaign through Sunday Supper LLC. All opinions are my own. These look amazing! I love the flavors! You had me at chimichurri! I like to use flank or skirt steak too, but how smart of you to butterfly the strip steak. Well done! I think flank or skirt steak are typically most common, but we used what we had on hand, and it worked very well. 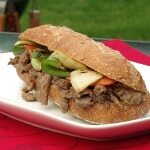 Next time we will have to try this with a flank or skirt steak! I love the idea for serving this as an appetizer! Make ahead prep works for me too. yum! We love anything that can be done ahead of time! This.Looks.Fabulous! 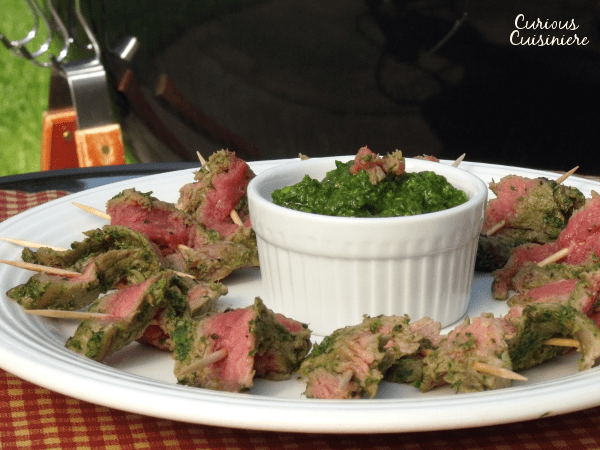 I love chimichurri and this would totally hit the spot!!! These are a great appetizer idea! Mind you I would have trouble stopping at appetizer. lol Looks delicious! I have to make your chimichurri! And your steak. Looks amazing. These look delicious. I love chimichurri sauce! This is one of the prettiest appetizers I have ever seen! Yum!! Thanks Liz! They didn’t last long for us! What a wonderful summer appetizer. I love the bright green of the chimichurri on the steak. Thanks Renee! The chimichurri is such a fun color!